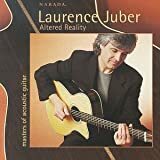 Laurence Juber (born 12 November 1952) is an English-born musician. Often considered most famous for playing lead guitar in Wings from 1978 to 1981, he has since had a distinguished career as a solo fingerstyle guitarist and studio musician. He is married to Hope Juber and they have two daughters, Nico Juber and songwriter Ilsey Juber.